Why is the Feast of St. Francis is so important for the Dominicans? It is not unusual to hear some Dominican friars referring to St. Francis as our father Francis and some Franciscans calling St. Dominic their father as well. Tradition holds that during Dominic's second visit to Rome in 1216, he met Francis of Assisi in one of the churches there. Both of them were seeking the Papal approval and confirmation of their respective orders - the Order of Preachers and the Order of Friars Minor. 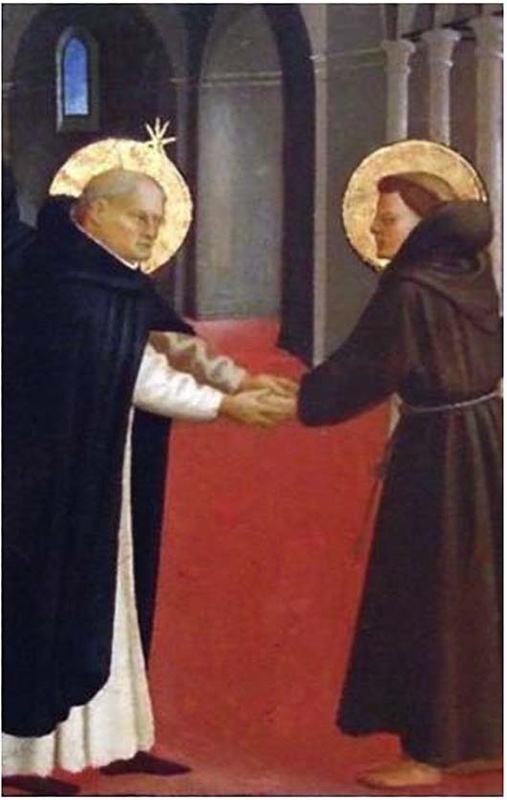 Due to this encounter, a dose friendship sprang up between the two, and to this day Dominicans and Franciscans consider themselves close to each other. For instance, in many places it is a tradition for the Franciscans to invite a Dominican to preach and celebrate the Feast day of Saint Francis and vice versa as a sign of unity in their mission. To better understand the mission of both Orders, it is important to recall a dream that the Pope had before meeting Francis and Dominic. The Pope had a dream in which the Church was falling apart and he saw two columns sustaining the Church. When the Pope met Francis and Dominic he understood that they were the two columns who will support the Church by their Preaching (the Dominicans) and by their life of poverty (the Franciscans). They both would do what Christ in the Church at Saint Damiano asked from St. Francis, "Rebuild my Church." Since then, Dominicans and Franciscans have been obedient to that command from Christ, rebuilding the Church in times of turmoil and ignorance. St. Francis, we thank the Lord for his holiness of life and his friendship with St. Dominic. We ask through the intercession of both St. Francis and St. Dominic that both Orders have the wisdom and the courage to continue the mission of rebuilding Christ's Church every time it is needed.